Lecture meetings are generally held on the third Thursday of the month at 5.30 pm, at the St Andrews Parish Centre, 43 Church Terrace Walkerville. For the Centre, enter and park off Fuller Street car park. Drinks and light refreshments are available before most lectures. Meetings may be followed by an optional light dinner at a local venue. Details about upcoming lectures will be advised in the bi-monthly members newsletter GeoNews. Members are requested to make a gold coin donation to help offset the cost of the venue. The cost for non-members is $10. Videos of previous lectures are available on YouTube. 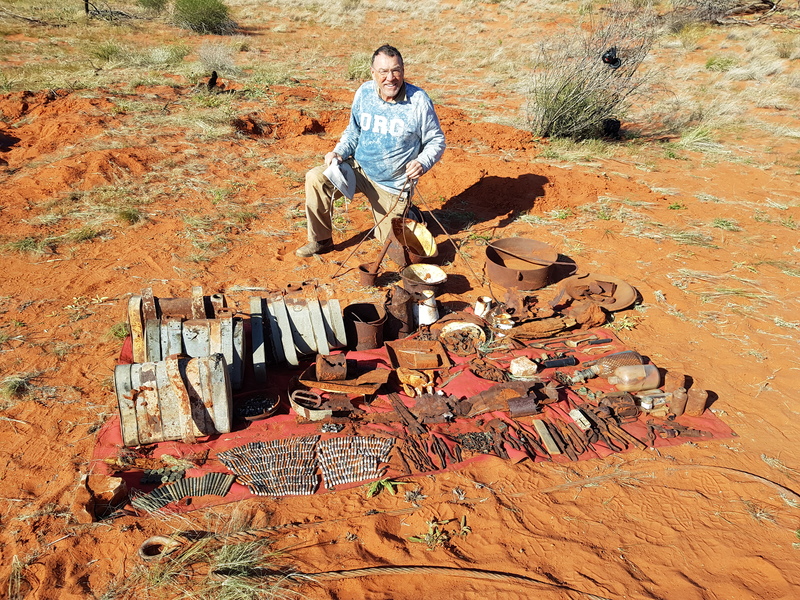 In 2018, Society member Larry Perkins and his brother Peter discovered a cache of equipment from the Barclay MacPherson expedition of 1904 in the Simpson Desert. The original expedition was facilitated by our Society working with the SA government to explore parts of Australia that were not yet mapped. Larry studied the original diary and worked with other community members of the Territory, using their knowledge of the Outback, to locate a cache of buried equipment the expedition left on their return journey. The original diary, transcripts of the expedition and some relics will be available at Larry's presentation. Larry Perkins, a regular bushman since he formally cut ties from Supercars at the end of 2012, says that the discovery compares highly favourably to his achievements in motor racing, highlighted by six wins in the Bathurst 1000. Come along and see geographical history come alive! Walking alone across Australia is not for everyone. However, LtCol David Mason, COS DGADGFLS, managed to do just that and his experiences and observations enroute will be the subject of this lecture. The Antarctic plays an important role in the Southern Hemisphere atmospheric circulation and similarly the southern hemisphere atmospheric and oceanographic circulations impact on Antarctic’s climate and ice cover. Beth Walton will talk about these interconnections including why the ozone hole was first observed over the Antarctic and how increasing atmospheric greenhouse gases can impact on sea surface temperatures, sea levels and Antarctic ice cover. Joc Schmiechen will speak of his recent trip to Easter Island and Peru, highlighting their ancient cultural heritage. Many of you will remember his lectures to us on Aboriginal Art and his deep interest and knowledge of indigenous cultures. Dr Steven Lapidge is the inaugural CEO of the Fight Food Waste Cooperative Research Centre. The CRC has almost completed its first year of operations and Steven will have plenty to report on. 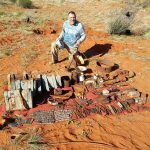 In 2 018, Society member Larry Perkins and his brother Peter discovered a cache of equipment from the Barclay MacPherson expedition of 1904 in the Simpson Desert. The original expedition was facilitated by our Society working with the SA government to explore parts of Australia that were not yet mapped. Larry studied the original diary and worked with other community members of the Territory, using their knowledge of the Outback, to locate a cache of buried equipment the expedition left on their return journey. There are probably not many Australians who have the chance to revisit the almost undisturbed sites of our settlement history, 114 years old; where events were created and perhaps ask the question, why? The Northern Territory Government and SA’s Artlab, centre of conservation excellence, are advising on relics assessment, cataloguing and finally finding a suitable repository. The original diary, transcripts of the expedition and some relics will be available at Larry’s presentation. “I may have won Bathurst but lots of other guys have won Bathurst,” he noted. “We found this gear and not too many guys find gear like this. We didn’t stumble across it. We were looking for it. The four-and-a-half-days on the quad bike paid off based on enthusiasm, homework and a can-do attitude, which I’m proud of.” the Northern Territory Department of Tourism and Culture.